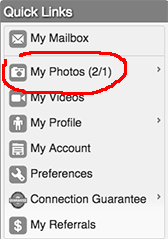 Unlike internet e-mail, photos on DancePartner.com are not "sent" as attachments. Instead, members upload photos to their photo gallery for others to view. Members with photos have a Photo Gallery button on their profile to display their photos. One photo may be designated as your Primary Photo, which is displayed directly on your profile and included in all notifications sent to others. Everyone has three galleries: Standard and Private for photos, and Credentials for document images. Each gallery may contain up to 26 images. Your Standard Gallery is attached to your profile. Any member may view it via the Photo Gallery button on your profile. Since your Standard Gallery is attached profile, the photos will be effectively sent (automatically) with each message (e-mail or greeting) you send. Photos uploaded to your Private Gallery photos are private. You may grant access via a Photo Pass. Find the Photo Pass containing message in your Mailbox Sent folder. Messages containing a Photo Pass are tagged with the icon. Click the Rescind Photo Pass button below the message (bottom left). You'll then be given a choice of which Photo Passes to rescind - one, all to a user, or all sent to anyone. The photo shown on your profile is called your Primary Photo. When members search or receive your message, your Primary Photo is attached, so it's very important to have a Primary Photo. A Head-Shot - head, neck, shoulders - of member (no others). Face must fill at least ½ the image, as in a drivers license or company ID. Face forward, not cut off nor excessively dark/blurry nor obscured. No sunglasses. Square or portrait ; not landscape . Which are suitable as a Primary Photo? Only the last! Hover over them (or tap them) to see explanation. Set as Primary Photo The image is pre-approved as a Primary Photo. Click to select this image as your Primary Photo. Adjust as Primary Photo Not approved as a Primary Photo (yet). If the face is large enough and unobscurred, click to crop the image to create a head shot. Private Gallery - these photos are viewable by permission only. You must send a Photo Pass (via an e-mail or greeting) to grant a member access to your Private Gallery. Credentials Gallery - these images are viewable by permission only. You must send a Credentials Pass (via an e-mail only) to grant a member access to your Credentials Gallery. Click the Photo Upload area to open a file browser. Then select a photo, and confirm. Uploading begins automatically. If you're using an old browser, use the Browse... or Choose File button to open a file browser. A row of buttons below your photo are available for various operations. Crop Calls our photo editor to allow you to trim ("crop") the photo. Handy for making a head shot from an existing photo, or just trimming out extraneous material. Rotate Rotate photo. Options are 90° counter-clockwise, 90° clockwise, 180° clockwise. Duplicate Make a copy of the photo, perhaps because you want to make a cropped version and keep the original. Move Move the photo to another Gallery.